The 4XEM IPCAMW50 has been discontinued. No direct replacement is available. 4XEM's IPCAMW50 wired IP Network Camera features a 1/4" CCD Image Sensor, MPEG 4 video compression, Generic I/O Ports (1 input, 1 output) and a sensitive microphone. This IP Network Camera is ideal for applications that require the image quality and low-light sensitivity offered with a CCD image sensor. 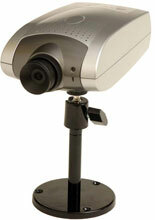 Bundled software allows monitoring and control of up to 16 IP Cameras from any web browser.